For both American GI Wendell Lett and German seaman Holger Frings, the relentless bloodbath of World War II has become a treacherous prison and a curse. Just as Wendell Lett meets Heloise, a wise Belgian woman who offers him a chance of deliverance from the physical and emotional carnage of war, he is pushed into a reckless false flag mission. At the same time behind enemy lines, Frings becomes a forced volunteer for a similar German operation that takes him to a breaking point. The two enemies’ destructive fates collide in the surprise Ardennes counteroffensivethe 1944 Battle of the Bulgeand both have to finally confront the war that betrayed them. As Lett tries to find his way back to his beloved Heloise, he and Frings team up to desert their savage overseers while the battles rage around them. 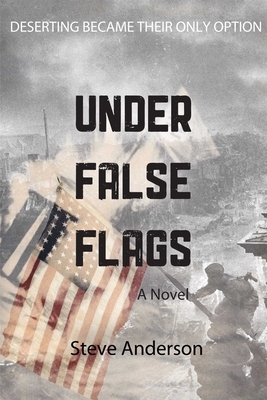 In Under False Flags, the absurdity of war is brought to brutal light as each sidewhether friend or foeattempts to disguise their cannon fodder in enemy uniform. This is a gritty war tale that turns conventional notions of valor, heroism, and prestige on its head.